The scheduled match-up between Kell Brook and Shawn Porter is a highly intriguing one; both are unbeaten, spearheading the uprising talent, in the welterweight division, from the UK and the US respectively. For Kell Brook, the pressure is especially intense given that he’s long chased an Amir Khan bout, pulled out of a Devon Alexander clash (who Porter previously toppled), and yet remains relatively untested. Add all of these ingredients to the contrasting fight-styles of these combatants, and it’s easy to foresee a highly entertaining, explosive fight. 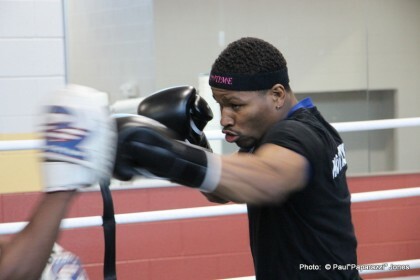 Shawn Porter’s style is unorthodox. He’s short but powerfully built. In the ring he stays on the outside, well outside of his opponent’s range, and cleverly accentuates his lack of height by keeping low. Then, almost cobra-like, he’ll literally launch himself into his opponent with straight punches and bombarding them with body shots on the inside. His style does bear similarities to Pacquiao of old, where he uses the element of surprise by jumping in with hard straight shots. It’s actually quite fitting that they were former sparring partners. However, unlike Pacquiao, Porter likes to fight inside. He can also use both hands and bends at the waist. His arsenal together with his awkward style makes him a very tricky opponent. Conversely, Kell Brook is very much an upright, stand-up fighter. He doesn’t really have much head-movement, and he doesn’t bend from the waist to avoid punches. However, he has incredible timing; his foot-speed allows him to be just out of range when a punch is thrown at him. He also has quick hands and devastating power. Once faced against each other, I think Kell Brook will have trouble finding and keeping up with Shawn Porter, who will always be out of range from where he can launch his attacks. Brook can use that stiff jab to deter Porters advances, but will ultimately be overwhelmed by the punch volume and his unorthodox style. Julio Diaz and Vyacheslav Senchenko showed evidence to suggest Porter can be out-boxed and Brook can be seriously troubled with well-timed shots and sustained pressure. However, both possessed the athleticism and power to overcome the older, veteran ex-champions. In this fight neither fighter will have such advantage should they get tagged and hurt. If the fight becomes a war I expect Porter to be at risk; Brook seems to carry the heavier hands. However, if Porter can manage to get inside on Kell Brook, past the danger zone, unscathed, it’ll be apparent that his inside game is far superior to Brook’s. If Porter is able to get in, with his head pressing down onto Brook’s chest, while working to the body, then it’ll be a long night for Brook. For Kell Brook, the question is: can he keep Porter in front of him at ideal distance to be able to utilize his size and power advantage? If Brook can answer this then he has a decent chance of snatching victory. The speed and movement of Porter gives him the edge in this fight. Brook does, however, possess the power to end this fight by stoppage should Porter run into one of those hands. I think the fight will be exciting and wouldn’t be surprised if either takes a fall. But ultimately I’m predicting a Shawn Porter victory by TKO.